is an expression that embodies the essence of the Christian life. Jesus Christ comes into us to dwell, creating in us new life, a new creation, and a new nature. Power wells up from this new nature, motivating us to good works out of love for God. Our new identity comes from the Father; we have Jesus living in us always; and the Holy Spirit empowers us to be more and more like Christ. 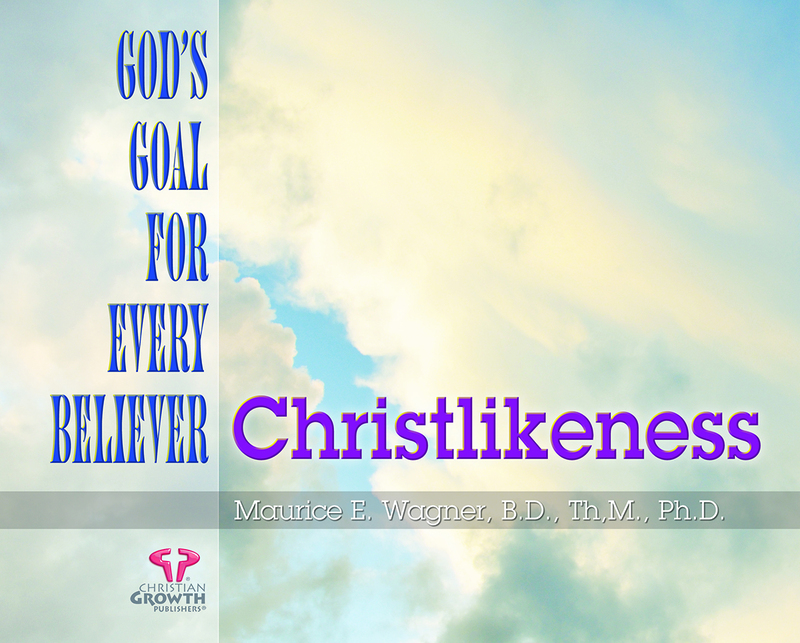 Dr. Maurice E. Wagner embraced this as a slogan for the unique concepts he discerned during his 60 years of ministry. If relationships that are positive and productive is your desire then you will need an adequate self-concept. On your own this a daunting task because God must be your first relationship. This book shows how you can be a new person. God+me=ME a whole person, was coined by Dr. Wagner 50 years ago in order to express the Biblical truth that a new identity is born in you when you invite Jesus to take control of your life. This transaction gives birth to a new person in you which starts to grow by being nourished with God’s Word, breathing praise and thanksgiving, while embracing suffering as a challenge not a punishment. The resulting growth gives you true security in knowing that you are somebody to God. In this security you are freed from the control of your old nature and the destructive practices of your past. Now, you can feel that you really are somebody, because you are somebody to God. This work was one of the first of its kind during the last century. The psychology that God has placed in the Bible predates all human attempts to explain mental development. 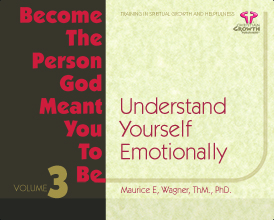 From Scripture, Dr. Wagner has distilled a unique system of threes that explains the development of the human identity. This system mirrors God’s revelation of His identity as triune and reveals how you are created in His image. Here you will find practical principles that will give solutions to personal problems and will help you relate to yourself and others. This is a Bible study with practical help. It will give you insight almost immediately so that you can begin to experience for yourself, The Sensation of Being Somebody and start experiencing the joy of productive relationships. 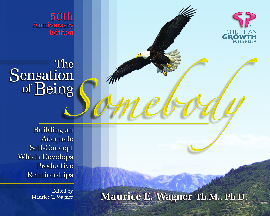 by Maurice E. Wagner, Th.M., Ph.D.
A 12 week daily study guide that helps apply the Biblical truths explained in The Sensation of Being Somebody. It contains insightful questions that you will find useful in personal or group study as you seek to build your adequate self-concept in Christ Jesus. Anger, the most common and destructive emotion, which seems to attach itself to us and explode without warning. Controlling, venting, ignoring, and talking are some of the common answers offered for managing this volatile energy, but are they really the biblical antidotes? 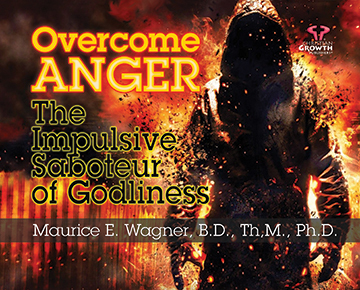 Dr. Wagner discusses how God gives us the option of eradicating anger at its source. The Christian who takes this biblical understanding into the marketplace of life will find there is always a good option to acting upon the compulsive outburst of destruction. Anger is obvious at times, yet illusive at other times. This book identifies various types of anger and many of the more subtle ways they creep into our lives as bitterness and depression. This practical study is useful for all Christians that have experienced anger and want a godly solution to this hurtful problem. Basic teachings of the Bible needed for practical everyday living. Subjects include Your position with God as part of the family, prayer, security, who God is, who Satan is, temptation, forgiveness, truthfulness, God's will, and gratitude. 150 pages with questions and many helps. Designed to fit into a quarterly class setting. Volume 4 presents a biblical interpretation of the purpose of life’s many problems and guides the reader in mastering most of the common adversities as well as a few of the more complex. As you have probably noticed from the “Contents,” this manual is divided into four sections. Each section considers issues that are vitally important to training Christians to be Caring Friends. The four Sections suggest one hundred examples of human distress (abbreviated LS for Life-Situation) and explain how the Caring Friend may use what he knows to be helpful. Reference is made to pages in each Volume where a similar life situation was suggested. The Four Sections also provide thirty-one Special Helps (abbreviated SH) which provide information not included in the four volumes. We are speaking of being more than good friends, we are speaking of becoming Caring Christian Friends who have developed a measure of understanding of the difference between phileo and agape love. C. C. F’s. want to be used of God to the limit of their ability in helping people who are in distress. The training they receive gives them a significant measure of usefulness, and when they realize that a person needs a medical doctor, a professional counselor, or a psychiatrist, they make the recommendation and try to help him find someone among the available professionals in the area who can help. This is an effort designed not only to help Christians fulfill their calling and exercise their gifts, but, functioning as a part of the Body of Christ, they can be very helpful to the pastor, to the church leadership in developing godly love among the church body, and to be a positive influence for Christ in the community. Each Section contains fourteen Studies. It is suggested that a group only take one study per week. The fourteenth study consists of a presentation by each class member of a biographical sketch summarizing some of what he has learned during the past thirteen weeks that he felt would be useful as a Caring Christian Friend. The student derives this information from a journal he has kept of his activities and experiences during the Section. The theme of each autobiography should be “Changes in my thinking and feeling I have experienced during these studies.” The paper should be read before the group so that all can benefit and praise God for what He has done. Also, at the close of the fourteenth session a diploma should be presented to each participant who has met the requirements established by the church or the committee in charge of this second phase of training. As this program progresses, those receiving diplomas should receive recognition before the church body for each Section. The pastor can guide certain distressed persons who are seeking help to one of the Caring Friends who might be helpful. He then can guide the process vicariously, if he chooses. Confidentiality will be preserved and all will benefit. At the conclusion of each Section is an index that should guide one quickly to help when needed for certain types of Life-Situations covered in that Section. This also indexes Special Helps presented in that Section. At the conclusion to the last section of this Manual is a Subject Index to all Life-Situations and Special Helps covered in all Four Sections. I have divided total human need into four quadrants. Each quadrant is researched in the Bible. Each volume of “Become the Person God Meant You to Be” represents one of those quadrants. SECTION ONE prepares a Caring Friend to be helpful to persons who have insufficient knowledge of biblical truth, or has been misinformed. Volume 1 is now a reference textbook. The group studying this material will need to review the textbook carefully and think of themselves tackling the suggested Life-Situations. In this way, they can learn from each other and help each other to understand certain concepts that are not clear. This makes Volume I a resource book in helping others. 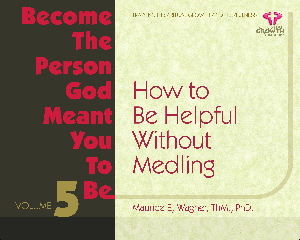 SECTION TWO prepares a Caring Friend to be helpful to persons lacking in an adequate self-concept. The Bible presents a resource for an adequate self-concept. Volume 2 is the reference textbook. Frequently people receive Christ as their Savior and do not realize that their concept of themselves can and should be radically changed now that they have become a child of God. They need to be introduced to a new sense of their own identity. SECTION THREE prepares a Caring Friend to be helpful to persons with a negative or a pseudo-positive mental attitude. Mental attitudes are developed by the way we habitually react emotionally to various types of life situations. Volume 3 is the reference textbook. Often people are trapped in a negative mental attitude and do not realize that there is a better way to think and to live. To change is hard work, but it is certainly worth the effort, but we need examples and support. SECTION FOUR prepares a Caring Friend to be helpful to persons who need guidance in the management of life situations. God’s way of coping with problems and hardships is very different, and often opposite, to the way we naturally try to cope with difficult circumstances. Christians who follow their Lord interpret their circumstances very differently from the non-Christians, and they must obey biblical instruction if they are going to grow spiritually by their experiences. Volume 4 is the reference textbook. This Manual presents 25 Life-Situations in each Section, and suggests pages that might assist in helping the person with such a situation. Also the Manual presents a total of 31 SPECIAL HELPS, which is instruction beyond the scope of the four volumes.. Each person who has completed the work should receive a diploma acknowledging the achievement granting him/her the authority to be a “Caring Christian Friend” to someone with the problem-theme of that Section. Thus the church that has assumed the responsibility to help them in their preparation to be a “Caring Christian Friend” and is authorizing them to work in a certain ministry. As a result, the church is obligating itself to pray for those it authorizes the same as if they were validating certain persons to be missionaries. 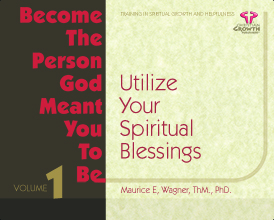 This book is designed to be a working model of true Christian psychology! The author's application of biblical truths to psychological concepts opens the door for Christians everywhere to come to grips with their emotional insecurity, their self-concept, and their interpersonal relationships. 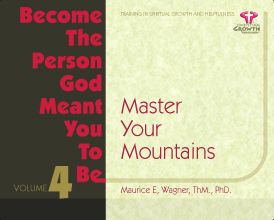 According to Dr. Wagner, "The person who has accepted a relationship with God through faith in jesus Christ has a real basis for inner security." Put It All Together provides Christian counseling and reveals scriptural answers on how to deal with emotional insecurity. These are brand new books that have been in storage since 1974. 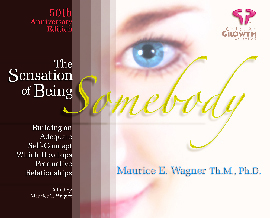 They are a collectors item as this title was the first published work of Dr. Wagner. The supply is very limited! These 13 lessons describe what anger is, how it is like a chameleon changing color according to how it can master the foe, what it does to others and what it does to ourselves. 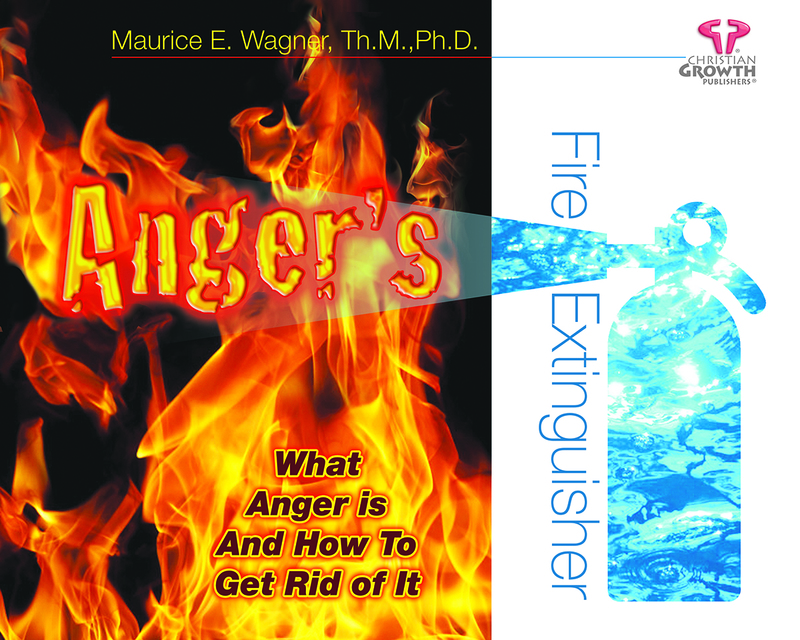 The latter part of the lessons discuss how to overcome anger in its various forms. The Bible clearly forbids Christians from allowing any amount of anger in their behavior or feelings. Anger is an emotion of independence from all authority, and thus it robs us of our submissive relationship with the living God, our redeemer. Instead of having faith in God, we demonstrate faith in ourselves, whether justified or not. Anger is the opposite of love, of mercy, or justice, or humility, It is the opposite of thanksgiving, humility, and submission. This is one of the most popular little books of lessons I have ever written. I believe you will find it very informative. God clearly tells us, Romans 8:29, that we who receive Christ are predestined to become like His beloved Son, and In Hebrews 12:7-11, He tells us that He will use trials and hardships as His shaping tools to perfect the image of Christ in us. I believe you will be thankful as you study this book that God cares enough for you to mold you into the image of His Son so you will feel at home in His heaven and be a good witness for Him while on earth. You feel as though you are with Dr. Warren Frankel as he tells the stories of his world-hopping adventures. He will take you to real places, where you will meet real people who were sick unto death with no hope of ever seeing a doctor. You can almost taste the food and hear the noises of the ghettos where he has traveled. You can feel the joy as the people sing praise to God for the healing that his team brought them. The trip you make with him in your mind will transport you to China, Africa, Mexico, and many other places. Through his simple storytelling style, he will take you to places of danger, disease and suffering. He will show you how God uses a person's simple desire to serve, and transforms it into His healing hands, God's hands to those that need a touch from their Saviour. Dr. Frankel is a member of His Healing Hands, an organization that takes short term mission trips with a team of professionals and ordinary folks like yourself. You will see through this man's life that whatever your background or whatever your training, you can experience the joy of serving. After reading this book you may see more clearly what you can do to become the person God meant you to be. Anger is an emotion of the soul expressed by feelings of anger in the body. Hostility is the unfriendly attitude that is expressed by the anger emotion. By nature, Romans 8:5-8 tells us, that by nature, our sinful nature inherited from Adam (Rom. 5:12) is hostile toward God, and our sinful nature is often expressed by anger at Jesus Christ, using His precious Name in vain when angry. These thirteen lessons attempt to throw light on the attitude toward anger expressed in God’s Word. We are commanded to get rid of all forms of anger (Col. 3:8). A rhetorical question is just this: How can we expect the blessing of God’s leading when we disregard such plain instruction, and assume the attitude of Psychology that a “little anger” is all right. It always amazes me to see how such a little pill for a person can cause a radical change in how that person feels, especially if it is a pain pill, or a tranquilizer. Another type of little pill can destroy a person’s life. Like a tripod holds a camera firmly, Satan uses our three natural emotions like a tripod to invade our minds with self-assertive efforts that show no faith in God. If we are feeling guilty over something we have done, we feel most insecure. This insecurity makes us instantly angry which is an illusion of self-sovereignty, free from responsibility. We do as we please while angry, and feel right in doing so. When anger fails to maintain this unrealism, we become fearful, for we have lost our defense against the insecurity caused by guilt. Our fear, or anxiety, causes us to be unrealistic in escaping from the present to thinking as though the future were the present. Then we try to resolve our fear of humiliation and punishment by an unrealistic attempt to construct a safety type of situation. God’s way of lovingly leading us to receive Christ as our atonement for our sins, and be forgiven by Him. This series of thirteen studies is intended to make us aware of how easily Satan can trick us into becoming self-reliant and avoid exercising faith in God and His way of salvation from the consequences of our sins. There is a question that requires an answer, but nobody seems to be asking the question. It is just this: When I feel guilty before God or man, how can I believe in myself that I could ever do anything good? Yet parents don’t seem to realize how they put their child in a “catch 22” when they scold and condemn their child for disobedience, often inflicting painful punishment, and then expect the child to come back smiling, perhaps asking, “Please tell me what can I do for you?” They are probably following the only model they had for parenting, their parents, who had parents who did the same thing. Our God does not function that way. He deals with the disobedience in a very different way. He is sinless and holy. He is also just. He is love, merciful, and gracious. So He provided the punishment for our sin by giving His only begotten Son, whom He declared from heaven that He was well pleased, by letting the violence of mankind to abuse and crucify Jesus as a criminal for us – who knew no sin – as our sin offering. He raised Him from the dead so He could be our High Priest in heaven keeping us forgiven of our daily sins as we confess them to Him. You see, God wanted His children to have a guilt-free mentality so that they could believe in Him and allow His Holy Spirit to lead them through circumstances that would mold them into the image of Christ and at the same time make them witnesses to those who need Christ as their Redeemer. You will find these thirteen lessons full of practical insights that motivate a person to live godly in Christ Jesus. When we are born again, we may be adults, but we are spiritually just babies. We need the milk of the word, the easy to understand teachings of the Bible, to grow spiritually. Later, when we become more informed, we can try to understand the more complex teachings of holy Scripture. A simple transaction takes place when we are truly grateful for a gift. We take possession of whatever the give may be when we express gratitude. The gift is ours; it no longer belongs to the giver. The giver wanted us to have the token of love, so our gratitude is a way of returning the love gesture. We are instructed in 1 Thessalonians 5:18 to be grateful to God in everything. When we can be thankful to God for the pleasant things, that ‘s easy. But to be thankful for the trying, the painful, the difficult, is not so easy. Being thankful for our hardships means that we take the hardship as a developmental exercise in our companionship with the living God. As an athlete puts his body under extreme stress for development, we take our stressful time as a way of growing spiritually to become more useful to God as an adult spiritually. These studies should be very helpful to those who study them to become more fulfilled in their Christian life whether or not they can measure their own spiritual growth. “I will never leave you or forsake you” (Jos. 1:5 and Heb. 13:5) was Joshua’s undergirding courage to lead the Children of Israel to overcome the inhabitants of the Promised Land, for their “cup of iniquity” was full. It was God’s judgment of their sinful, idolatrous practices that they were destroyed. This series of studies considers thirteen different life-situations in which we can count on God being with us. This book is intended to be comforting instruction to all who study its contents. As God was with Joshua to give him the skills of leadership of a nation, and of warriors, that he needed to fulfill God’s promise to Abraham, so He will be with us to accomplish His will. “For we are God’s workmanship, created in Christ Jesus to do good works, which God prepared in advance for us to do” (Eph. 2:10). God has redeemed us, brought us into Himself, into His Family of believers, so that we can fellowship with Him by faith in accomplishing the work He created us to do. No one can take our place, and He wants to use each one of His children! You will find this book helpful in your walk with the risen Lord Jesus Christ. 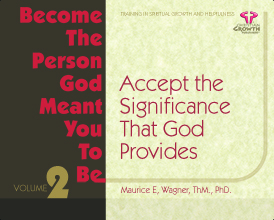 Emanuel Means God With Us Personally by Maurice E. Wagner, Th.M., Ph.D. When Jesus prayed this prayer this prayer in the Garden of Gethsemane, He was speaking as God, the second Person in the Trinity, without sin, destined to do what He came to earth to accomplish, and that was to atone for our sins. It is nearly impossible for us to conceive what agony he felt at this time. Being totally holy and without sin, to take on Himself our condemnation and being separated from His heavenly Father as we choose to be, and deserve God’s judgment for being independent of God, is beyond our total comprehension. His agony was totally not understood by his disciples who were near him and sleepy. His ordeal of crucifixion and death is beyond our human sympathy. What love is manifested by God the Father that He should reconcile Himself to us by putting His Son to death in our place for our sins! (2 Cor. 5:19-21) And then to commit to us, His redeemed ones, the message of reconciliation, because we love Him who loves us. Knowing all of this, makes us eager to be totally committed to doing His will in order to show our appreciation for His sacrifice, and to attempt to do this task because we love Him with all our heart, mind, soul, and strength (Mat. 22:37-39) and our neighbor as ourself. Because He has forgiven us of all sin, we are free to love ourselves because of His love for us; therefore, we join with Paul in saying, “I consider my life worth nothing to me, if only I may finish the race and complete the task the Lord Jesus has given me — the task of testifying to the gospel of God’s grace” (Acts 20:24). We show love for others, even our enemies, because of God’s unlimited love for us! Godly love is totally self-giving for the welfare of others. These are the emphases of the thirteen lessons in this book. I believe you will find these studies will bring you into closer fellowship with the living God. Walking by faith seems like stepping into the dark. “Your word is a lamp to my feet and a light for my path” (Psa. 119:105) describes how God’s Word, which is the foundation of our faith in God, giving us direction for the distant future as well as for the immediate step we need to take now. Even though walking by faith seems like stepping into the dark, we make the step and find His assurance that He is always with us and never will leave or forsake us. What an assurance of our fellowship with the living God! This series of thirteen lessons gives the reader a list of biblical evidences that he or she is actually walking by faith, or trying as usual, to walk by sight. Each lesson is an exposition of certain Bible verses. You will find this study most helpful in your walk of faith. An ideal is the ultimate goal. We seldom achieve our ideal goal, and if we do, we probably did not really have a perfect ideal. My wife and I have been married longer than many people live, and we are dearer to each other every year of our marriage. In this series of lessons I have presented the challenges we have face together, knowing that they are challenges that others also face in marriage. A truism must never be forgotten: When you are married, you are no longer single. That means every married person has some major adjustments to make in his thinking and reacting. Perhaps the greatest personal adjustment is managing situations where you and your spouse differ without becoming angry. Remember your marriage vows? You promised God and witnesses always to love each other. Love and anger are opposites like love and hate. Another truism is that we always become like the person we love and we become like the person we hate. Love inspires love and motivates closeness. Anger ignites an angry defense and motivates distance. You will find this little series of studies helps you to keep the goal of marriage clearly in mind so you can find fulfillment in living with your spouse. The thirteen lessons of this book follow the progression of the trials of being good parents to their children. It emphasizes the importance of love between the parents as well as being consistent in loving their children while instructing and correcting them, and in disciplining. It outlines three stages of parenting, and attempts to correct a common problem that parents encounter with teenagers. If parents are consistent in loving their children, they will enjoy their reward of their children loving them and being considerate of their needs as they grow older. You will find this series of lessons brief and provocative in helpful class discussions. This book calls attention to motive and choice which controls conduct, and does not deal with changing conduct alone. You will find it helpful in almost every chapter and will be discussing its content with friends with children.